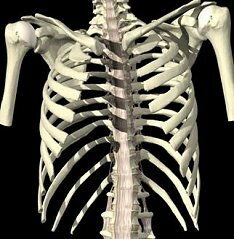 The rib cage is supported by ligaments and muscles. The ribs function to protect the internal organs against shock and aid in breathing. 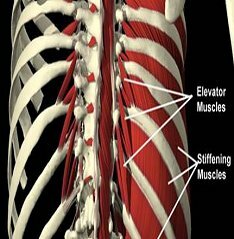 While inhaling the muscles (Fig 1) between the ribs elevate the rib cage allowing the lungs to expand. While exhaling the ribs move down to allow air to escape the lungs. The true ribs (seven pair) connect in the back to the spine and in front to the sternum. The false ribs (three pair) connect in back to spine and to the lowest true rib. 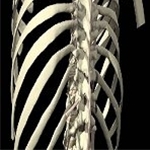 The floating ribs (two pair) connect in back to the spine but have no attachment in front. The costal cartilage is hyaline cartilage that extends the ribs to the sternum and adds to the elasticity of the walls of the thorax (rib cage). Shop our recommended supports for rib fractures and injuries. Read more..